This heavyweight 40kg steel desk frame, maximises stability at height, with a mighty 120kg lift capacity to boot! Three stage leg extension that adds to the overall stability. Telescopic and height adjustable for maximum flexibility. One of the quietest frames on the market at 39dB – barely registers against typical background noise in the workplace. All our height adjustable desks come with a 5-year warranty covering construction, material and production defects. Solid wood, reclaimed scaffold, walnut, oak, bamboo, birch plywood and custom desktops as well as laminate and veneer office furniture. A unique semi-assembled desk frame with quick and easy set-up. Simply affix both end bars and feet before attaching the desktop. It’s that simple. Change the way you work to transform how you feel. Flomotion are on a mission to help you feel more energised by transforming the way you work. We design workplaces that work better for you. Creating an environment where you can excel. Think better. Feel motivated. Be more productive. A kind of stress reduction approach that keeps you on your toes. Health at work is the backbone of our success. We know only too well the stresses you put on your back when sitting too long. And we are well versed in health issues that stem from back problems. Specialists in standing desks and seating that help keep you moving. 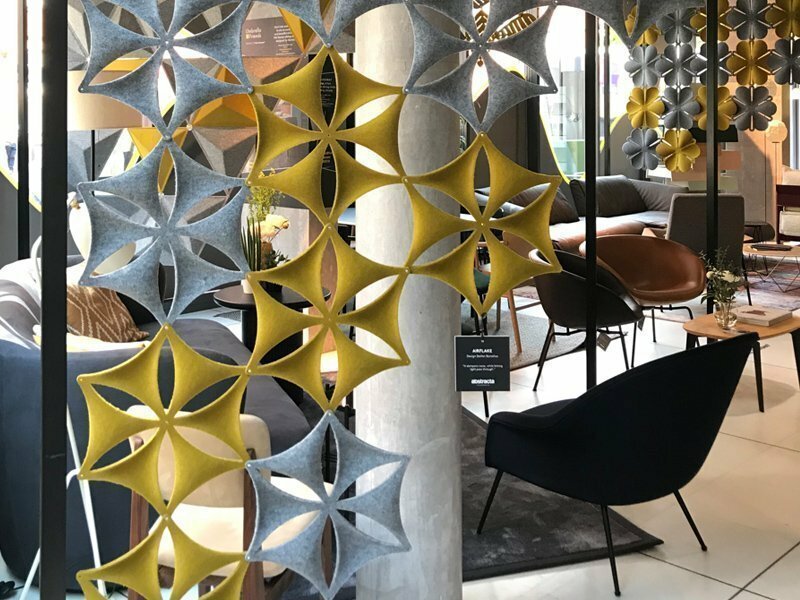 Attract and keep, talented, enthusiastic individuals by providing a happy and healthy workplace where staff feel valued and empowered – we can help you create an inspirational space. 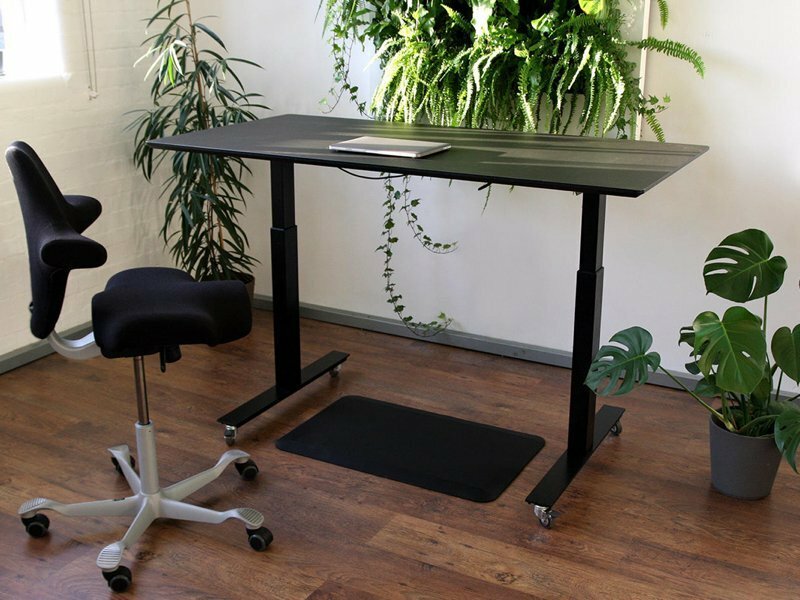 Aura electric height adjustable, sit-stand desks offer Danish design quality office furniture. Heavyweight, three-stage steel frame for maximum stability with powder coat finish in black, white and grey. Its telescopic frame provides numerous size options and is one of the quietest on the market too! Wide choice of desktops and sizes for best working practices. Arrives semi-assembled for quick and easy set-up or if you prefer we can assemble it for you. 5-year warranty. 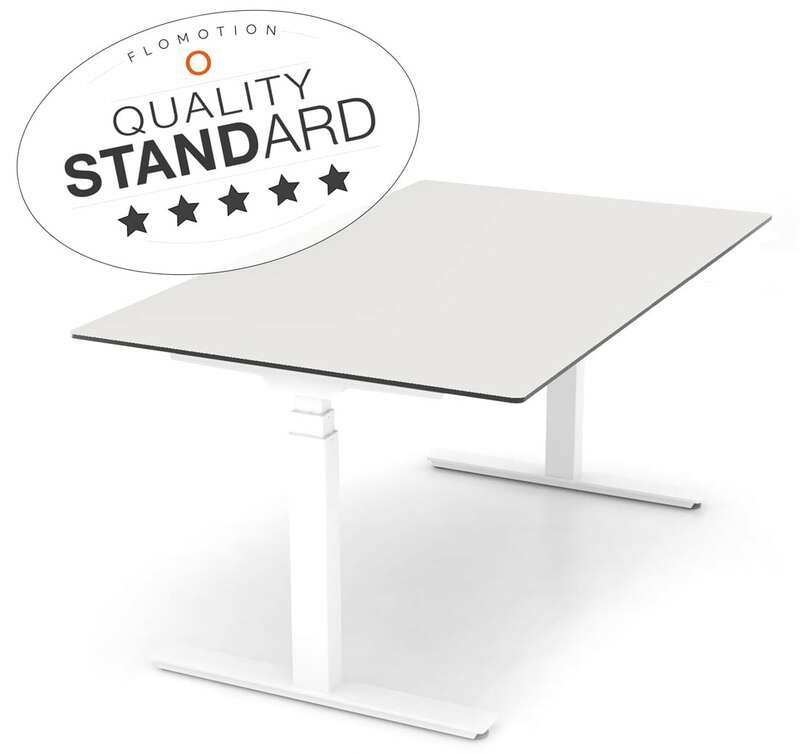 Endorsed by the Flomotion quality standard mark of excellence. This heavyweight 40kg steel frame, maximises stability at height, with a mighty 120kg lift capacity to boot! Three stage leg extension that adds to the overall stability. Telescopic and height adjustable, maximum flexibility, adapts with your environment. Unique semi-assembled frame – quick and easy set-up – simply affix end bars and feet before attaching the desktop. 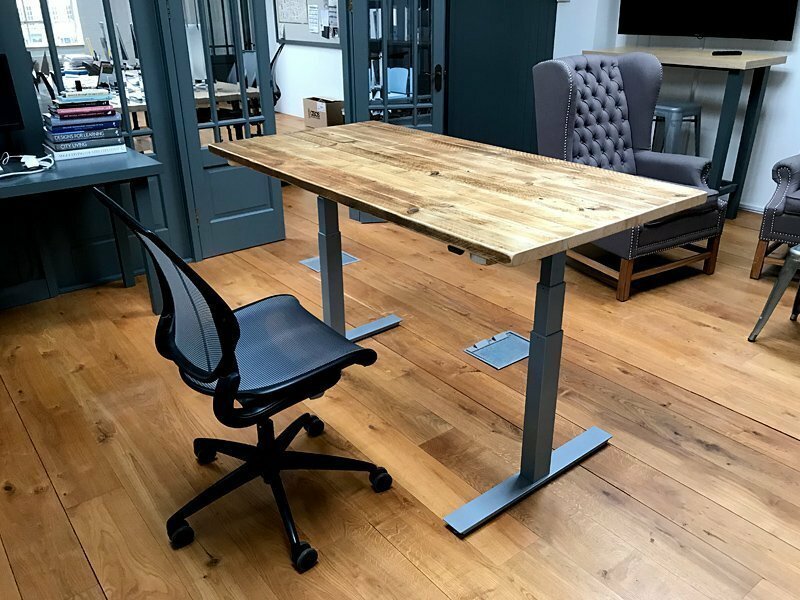 Wooden desks, whether you’re looking for the character of reclaimed scaffold or elegance of walnut, we offer a selection of standing desks with solid wood desktops. Standing desks with laminate desktops in colour and wood effect finishes. Contemporary white office desks are the most popular of the laminate options. Active seating allows you to sit, perch, or lean as you work, encouraging you to keep moving throughout the day. Office screens, dividers and acoustic panels help divide spaces visually, create separate areas and increase sound control.